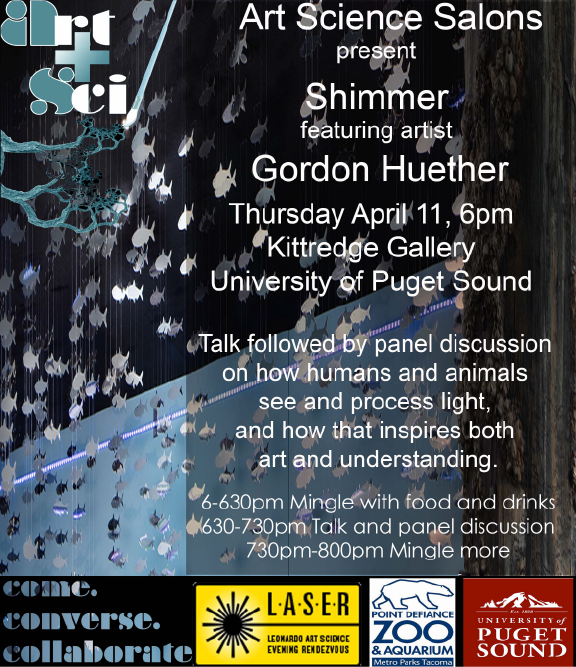 April 11, 2019: Gordon Huether, the California artist behind the “Shimmer” and “Shoal” installations gave a talk at the Kittredge Gallery April 11th followed by a panel discussion with Prof. Peter Wimberger, Director of the Natural History Museum and Siddharth Ramakrishnan, Director of the Neuroscience Program. 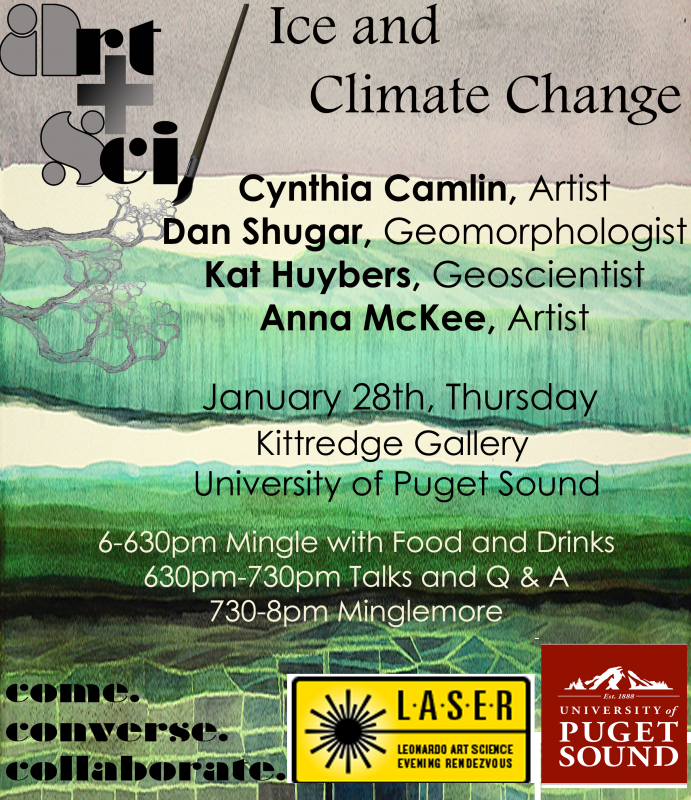 Huether and the two University of Puget Sound scientists discussed how humans and animals see and process light, and how that inspires both art and understanding. 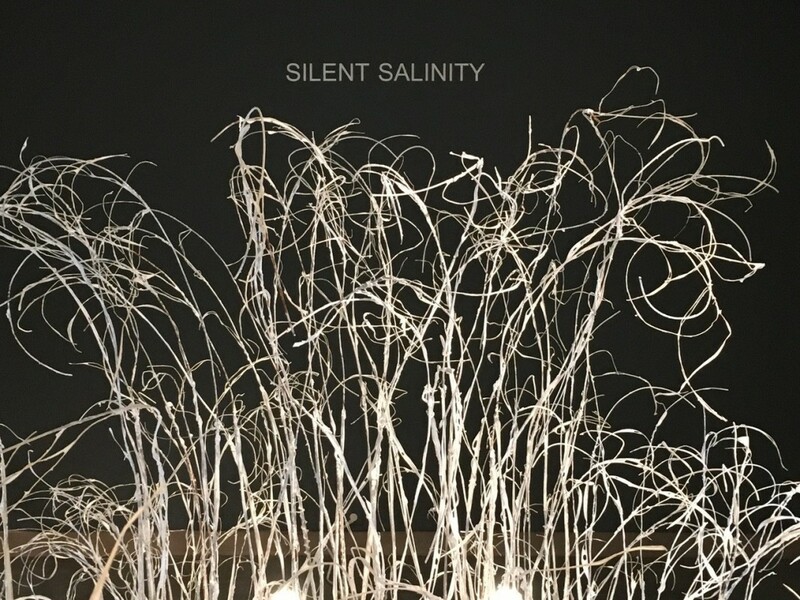 meditation, and what it means to be human. 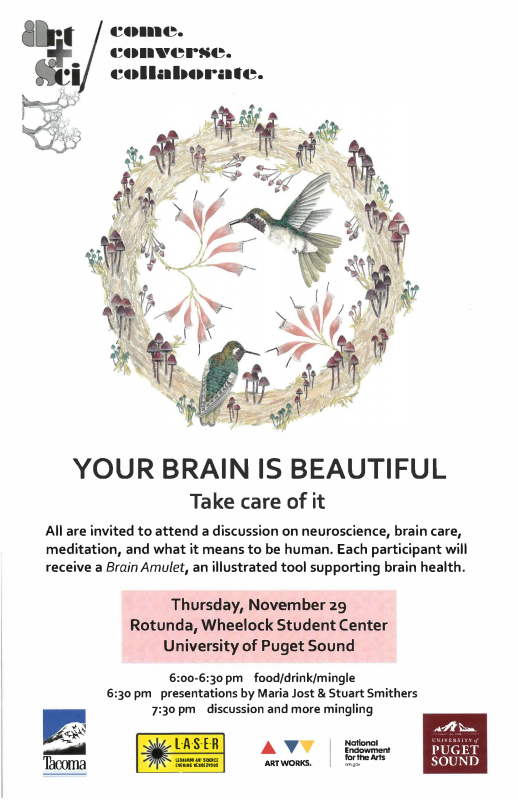 Each participant received a Brain Amulet, an illustrated tool supporting brain health. 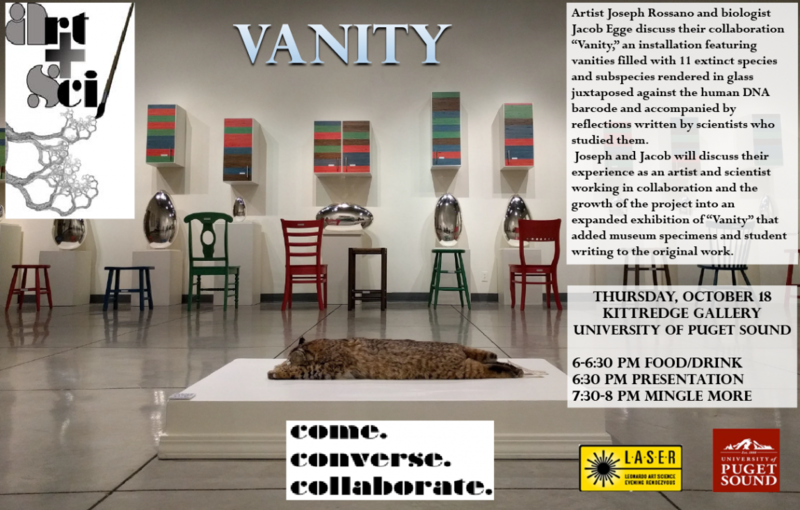 Artist Joseph Rossano and biologist Jacob Egge discussed their collaboration “Vanity,” an installation featuring vanities filled with 11 extinct species and subspecies rendered in glass juxtaposed against the human DNA barcode and accompanied by reflections written by scientists who studied them. 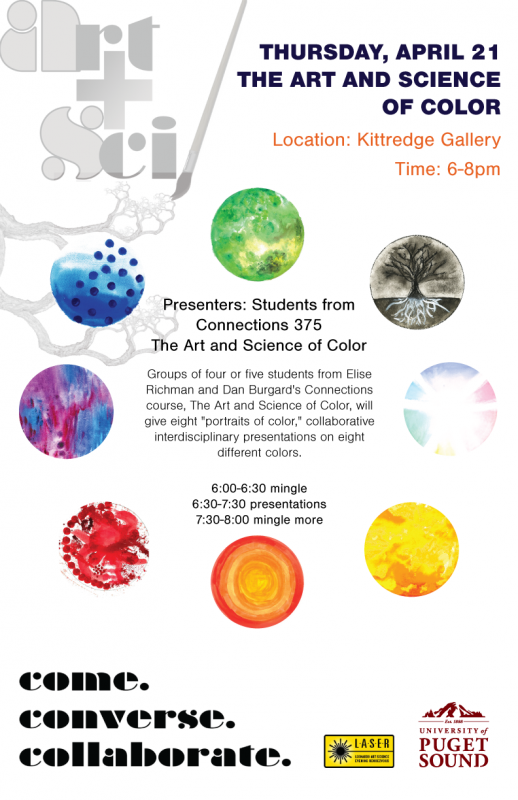 Joseph and Jacob discussed their experience as an artist and scientist working in collaboration and the growth of the project into an expanded exhibition of “Vanity” that added museum specimens and student writing to the original work. 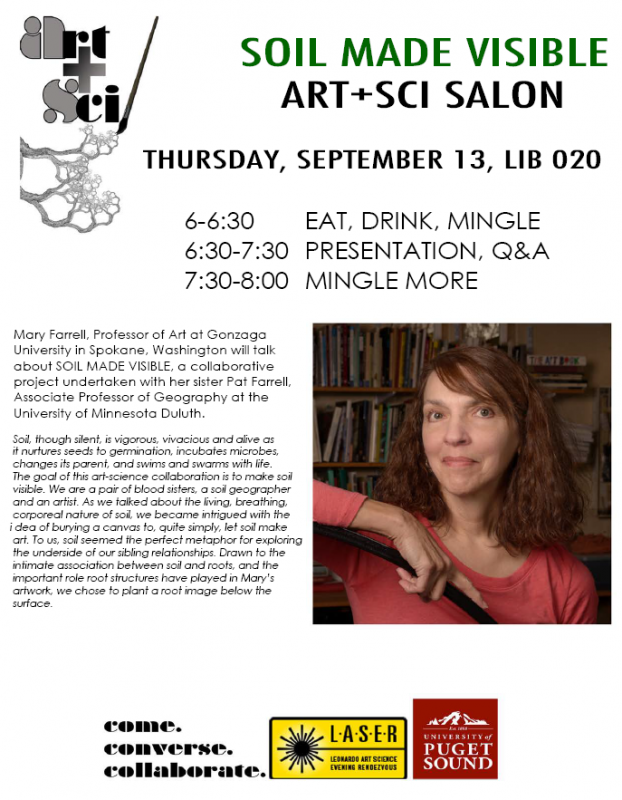 September 13, 2018: 6-8pm LIB 020, Mary Farrell, Professor of Art at Gonzaga University in Spokane, Washington spoke about SOIL MADE VISIBLE, a collaborative project undertaken with her sister Pat Farrell, Associate Professor of Geography at the University of Minnesota Duluth. 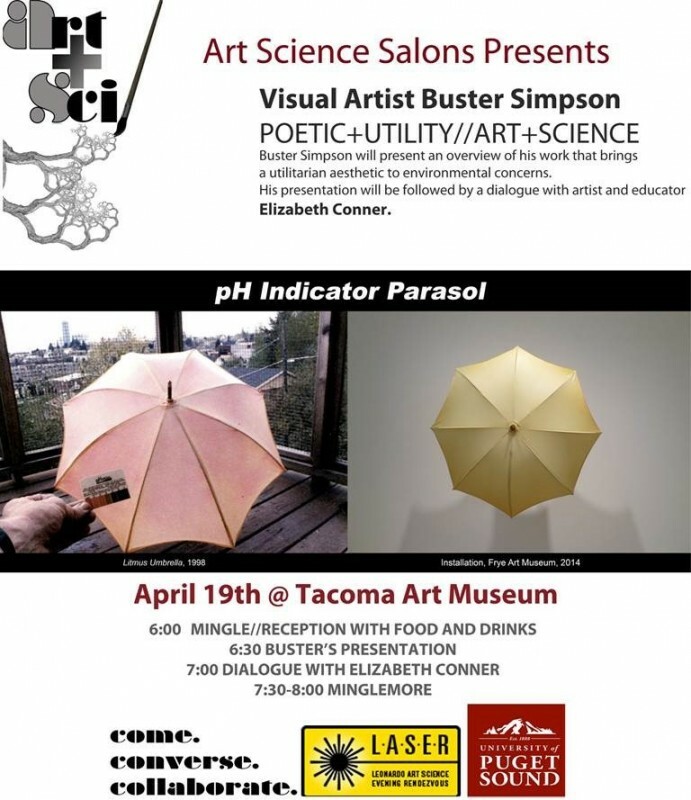 April 19, 2018: Visual Artist Buster Simpson POETIC + UTILITY//ART+SCIENCE, 6-8pm at Tacoma Art Museum. 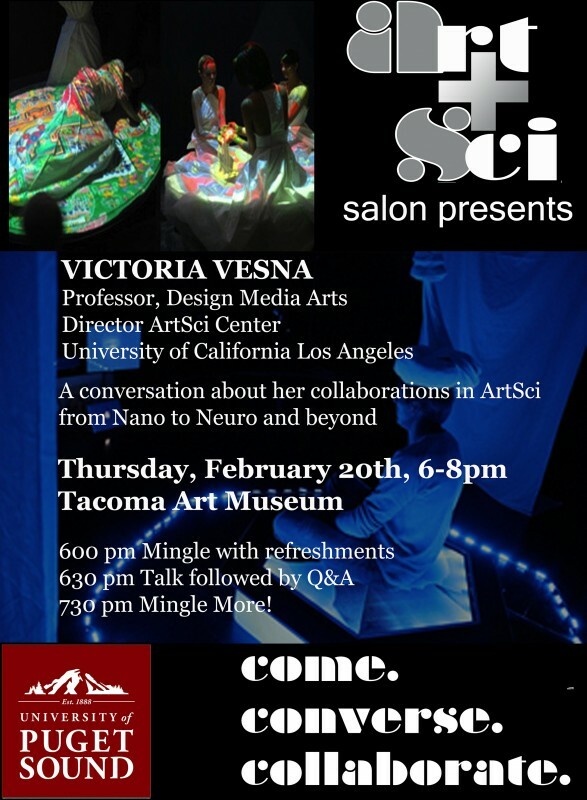 February 22, 2018: Art Sci Salon/ Workshop featured artists Mick Lorusso and Joel Ong on Locative Biomedia: The microbiome that we humans carry and exchange with others and the environments we traverse constitutes a constantly shifting map of relationships and influences. 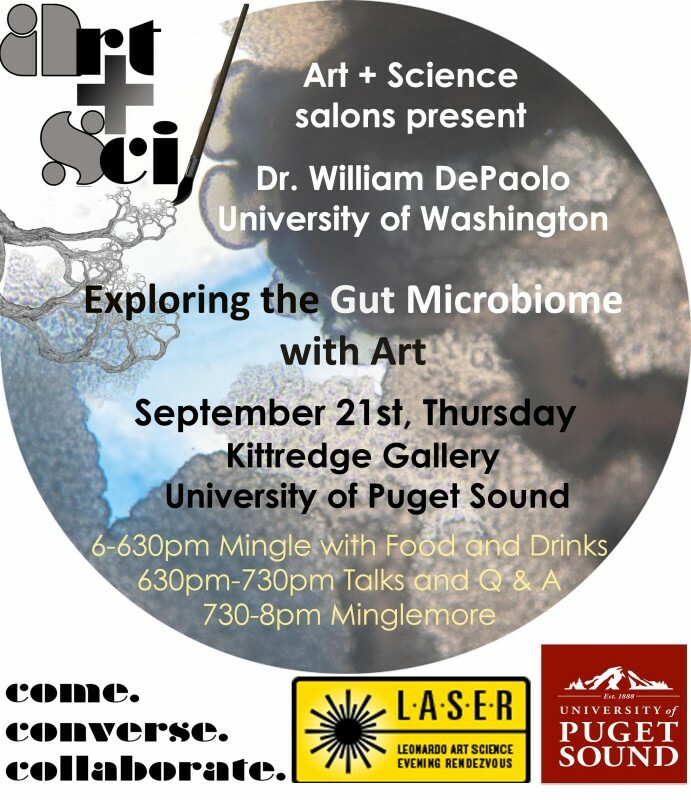 Through this workshop, Joel Ong and Mick Lorusso encourage participants to creatively engage with the microbiome and expand their imaginations to encompass this unseen realm that has such a large impact on our lives. 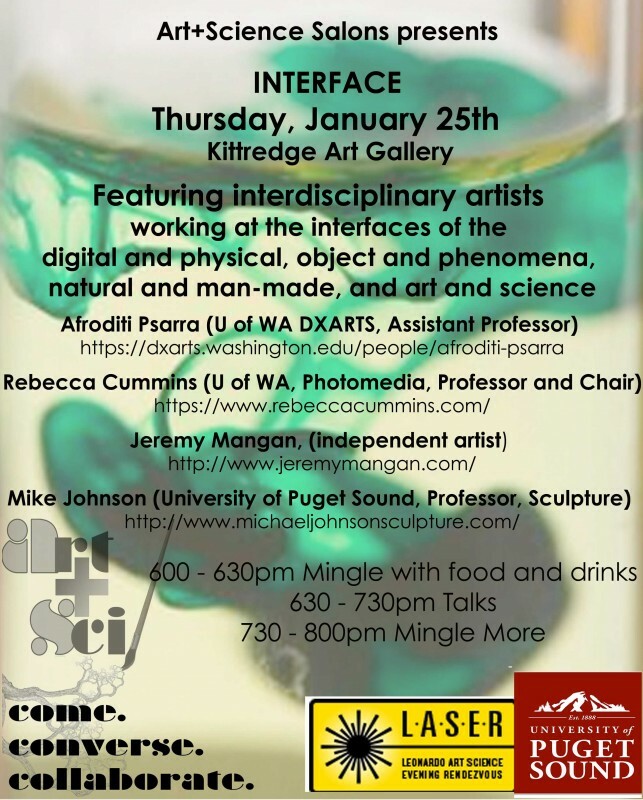 January 25, 2018: The theme was "Interface," featuring interdisciplinary artists working at the interfaces of the digital and physical, object and phenomena, natural and man-made, and art and science; event took place in the Kittredge Gallery at University of Puget Sound with featured guests: Afroditi Psarra (U of WA DXARTS, Professor); Rebecca Cummins (U of WA, Photomedia, Professor and Chair); Jeremy Mangan, (independent artist); Mike Johnson (Professor, Sculpture, University of Puget Sound). November 30, 2017: At Puget Sound, we have a new Makerspace (3D printers, 3D scanners, small electronics and tools for innovation and creation) located in the basement of the Collins Memorial Library. 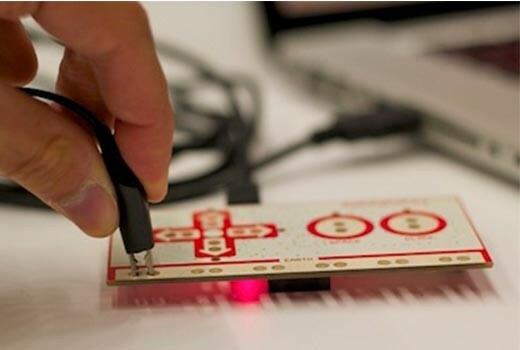 On November 30th, we issued a Makey-Makey challenge in our Makerspace: Use them to design a device that can help differently-abled people navigate the world better. Can you control a car without your hands, or help a blind person turn on a warning note while crossing the street. 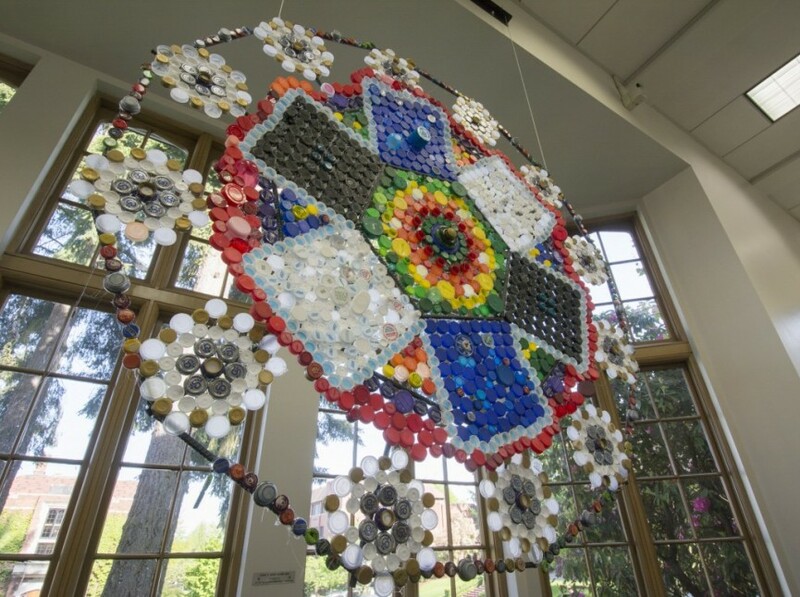 Part Art, Part, Science, Part Tech? 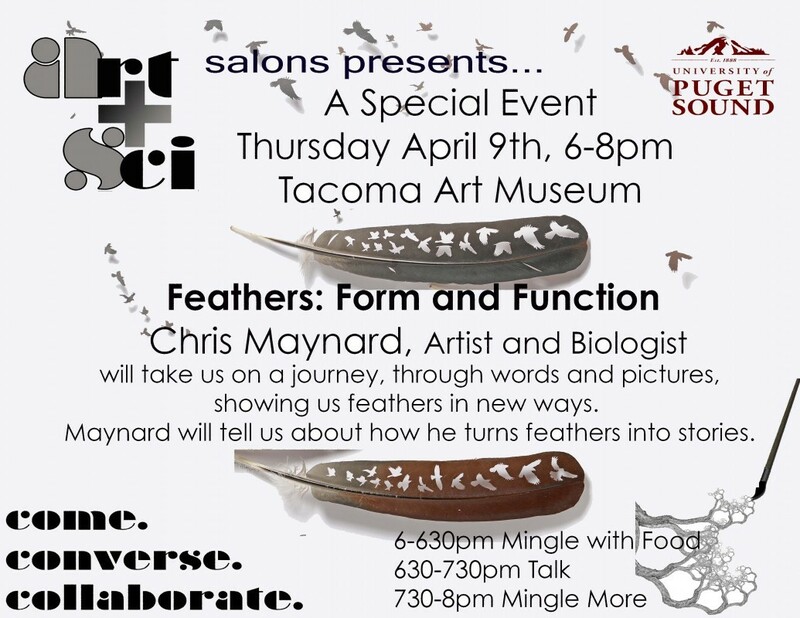 April 11, 2017: Mary (Maggic) Tsang from the MIT Media Lab visited the University of Puget Sound to enlighten us on bio-art, bio-hacking, citizen science with a talk, followed by a hands-on workshop. [an excerpt from Maggic:] // In response to the various ways that institutions both pollute and regulate our bodies through hormones, the Estrofem! Lab develops various methods of "freak science" for hacking estrogen and demonstrating its molecular colonization. 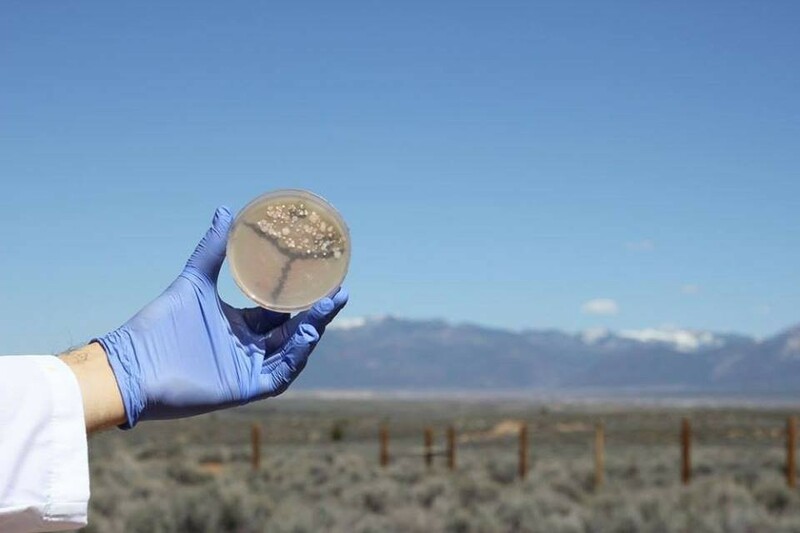 From yeast biosensors for detection to DIY column chromatography for urine-hormone extraction, these recipes serve as kinds of 'biotechnical civil disobedience,' combining body-gender politics and queer discourse with civic science. 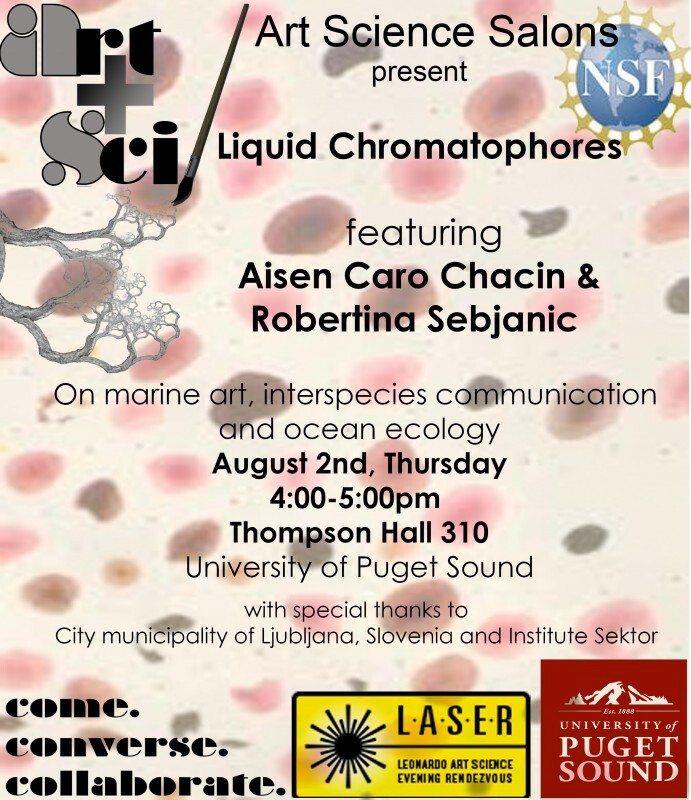 The workshop will begin with a short presentation followed by hormone-extraction action. Bring your own urine! 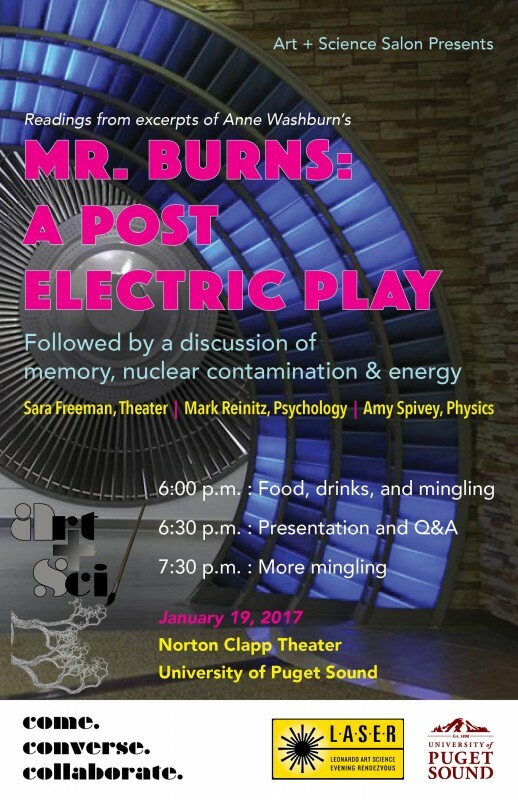 January 19, 2017: Norton Clapp Theater at the University of Puget Sound, Art + Sci Salon reading excerpts from Mr. Burns. 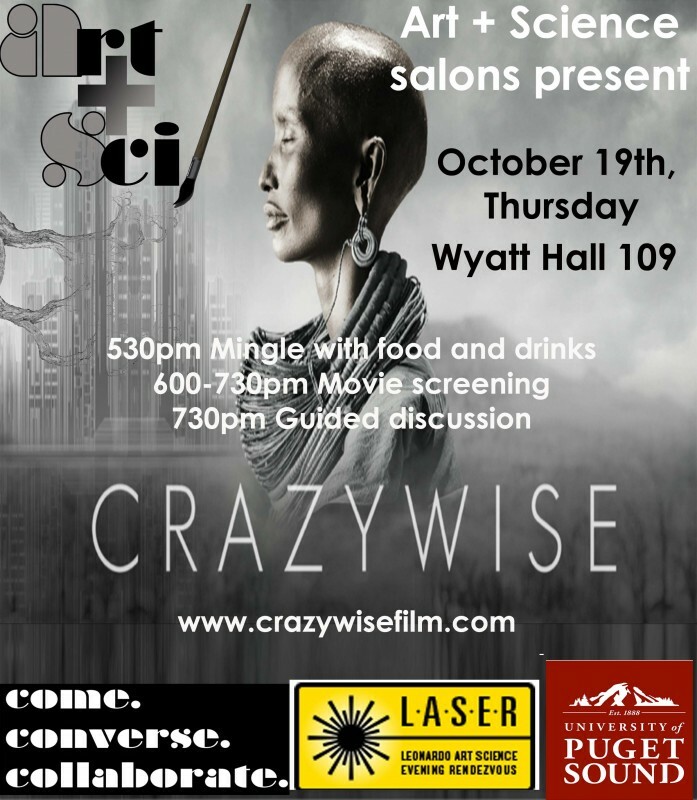 When there's no more electricity, and multiple population destroying events, how do human memories get preserved? Set month after the disaster, and then seven years and seventy-five years later, Anne Washburn's Mr. Burns: A Post Electric Play is both a comedy and then a ritual tragedy about a community preserving itself with the most unlikely of stories. 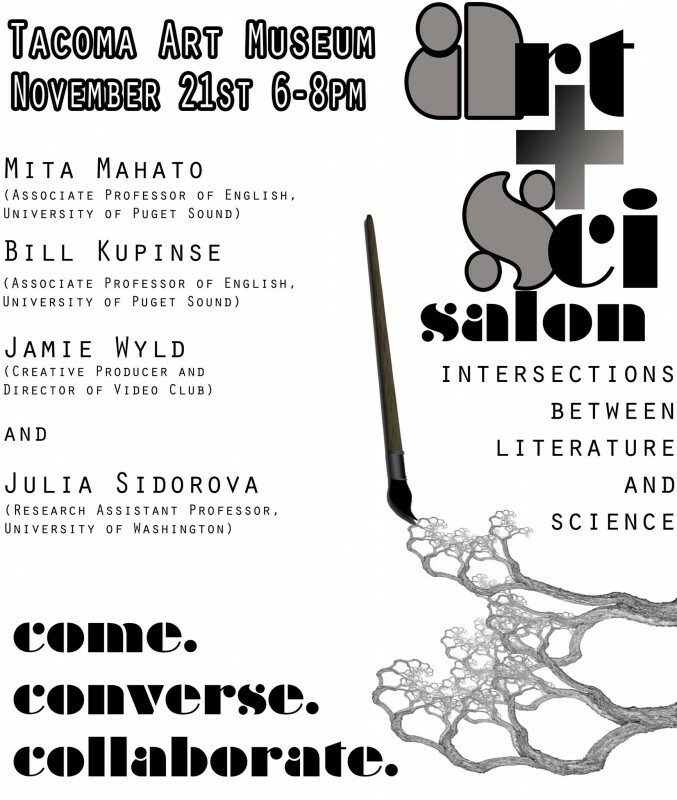 February 18, 2016: Art+Sci Salon from University of Puget Sound presented Art Science Now – The Past is the Future: A conversation and workshop with artists working at the intersection, with two Art+Sci alumni, Maria Jost and Graham Klag. 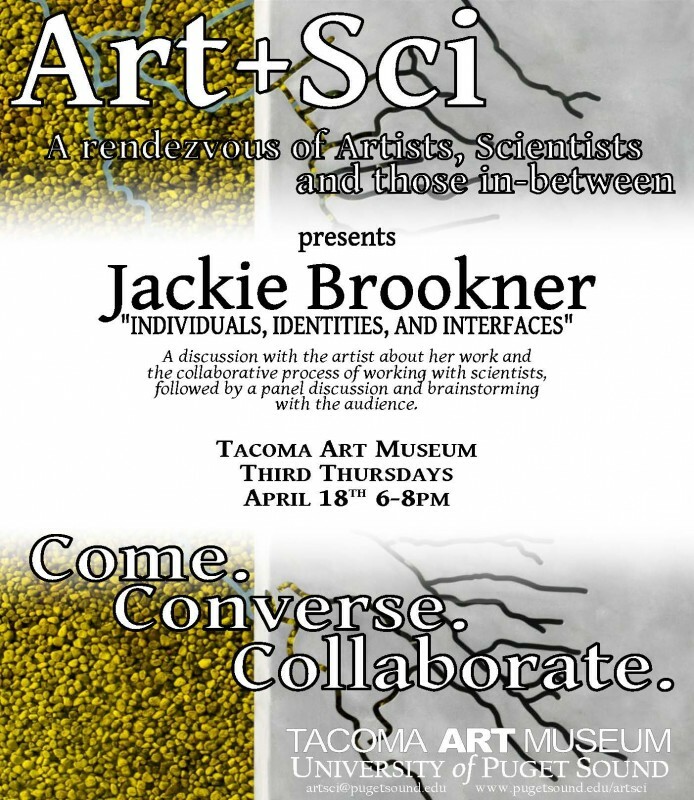 April 18, 2013: Third Thursday at Tacoma Art Museum, Art+Sci Salon sponsored a conversation with Eco-Artist Jackie Brookner. 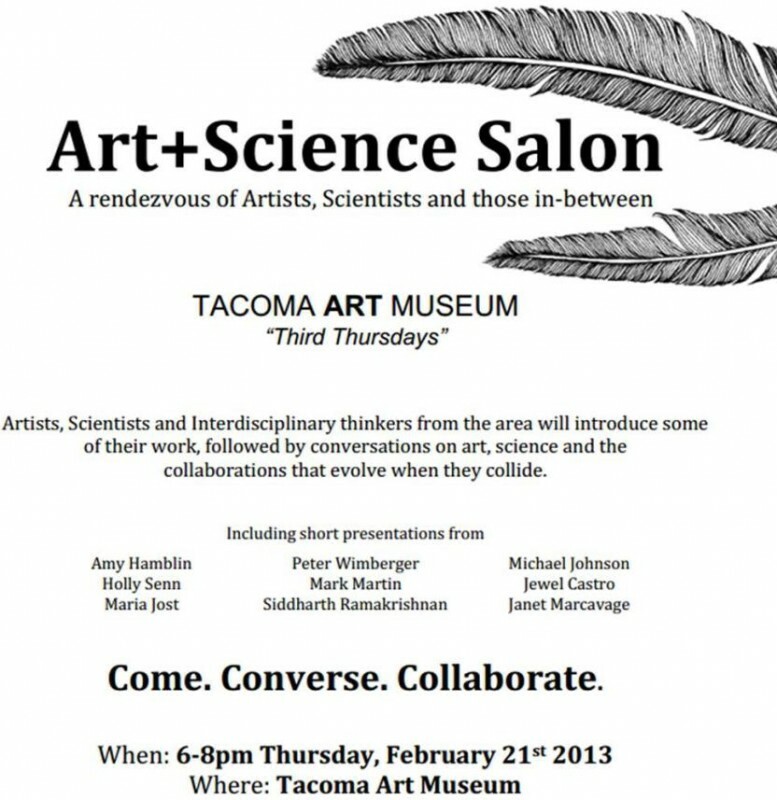 February 21, 2013: The inaugural Art+Sci Salon at the Tacoma Art Museum! 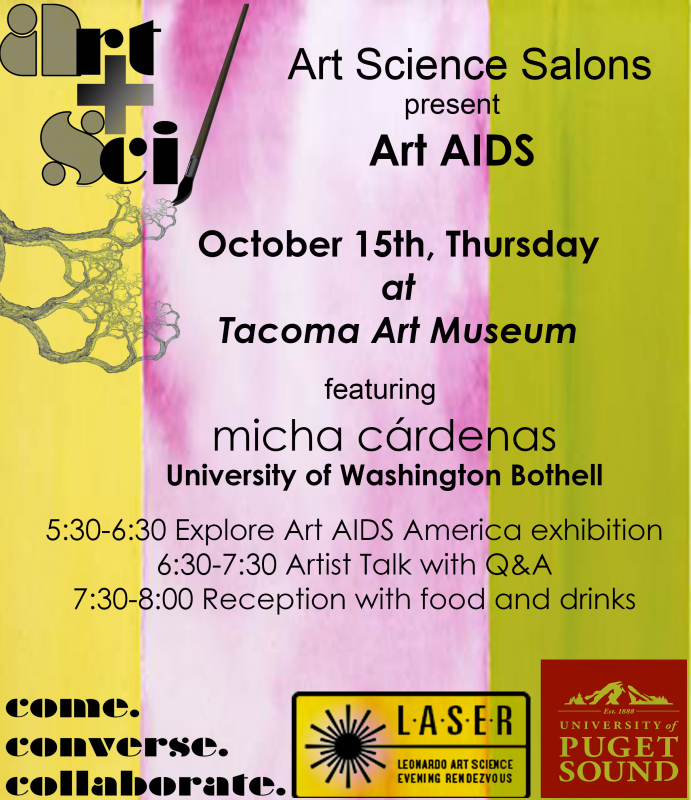 Our first gathering involved PechaKucha style, brief presentations about projects, artists, institutions, and any form of research exploring intersections between art and science. 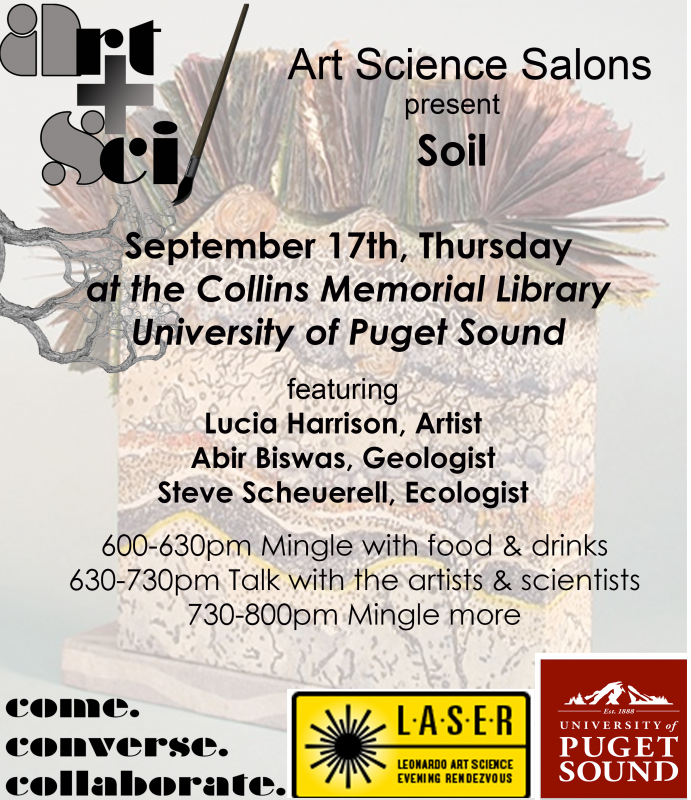 The Art+Sci Salon is an interdisciplinary forum organized by the University of Puget Sound faculty.